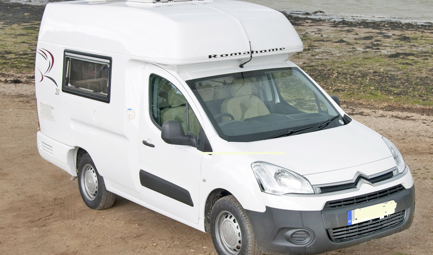 The Romahome R20 (pre 2012) is based on the Citroen Berlingo 1600 diesel van, it is a two berth compact motorhome with all the attention to detail that we have come to expect from the Romahome brand. It is easy to drive, is only 16&apos; 5" long and the Lo version is 6&apos;4" high which means it will fit in a garage or multi storey car park. The Hi version is 7&apos;6" high. The 1.6HDi diesel engine is very economical and will return 40-50 mpg according to the manufacturers. It comes complete with a compact galley kitchen with two burner hob and grill under which is a 3-way fridge. Opposite the hob on the other side of the van is sink unit above which is a neat little wardrobe hanging space for your long clothes. allows storage for bits and bobs. The bench seats are great for lounging and watching the world go by. middle gangway. There is ample light from a large heiki roof light. standing in the galley area. The bench seats themselves serve as two single beds or with the addition of the wooden slats provided will make a large double bed. There are handy spot lights above the seats. The cab area is curtained off at night time for privacy. Two side opening windows have blinds and fly screens. The van has a fresh water and waste water tank, there are two outside lockers one of which holds the gas bottle and the other is a handy storage area for muddy boots, levellers etc. Mains hook up is standard and a leisure battery is supplied, blown air heating is offered as an option. The video review below is of the Romahome R20 Lo version and was filmed at Avon Motor Caravans in Bristol. 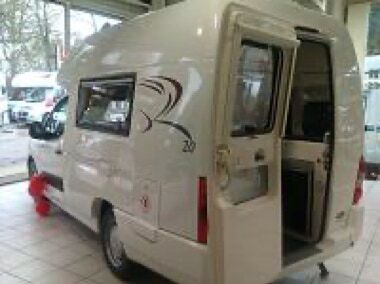 The latest model from Romahome is the New R20 which was unveiled at the NEC Caravan and Motorhome Show in October 2011. Designed by Barry Stimson to fit the latest Citroen Berlingo chassis, the main difference to notice straight away is that the New R20 is wider than the model it replaces but is still recognisable inside with all the features we have come to know and love. There are two versions of this model the hi and the lo, the latter will easily fit under 2m height barriers and has a lift up roof when camping. The extra width of both models has been utilised to provide a wider door facilitating easy access. Romahome provide a 10 year warranty on all its GRP components, the warranty remains in place after accidental damage provided repairs are carried out by Romahome or a dealer approved by the manufacturer. Inside the Romahome you have a range of flexible seating arrangements and L shaped lounge or pullman layout giving two rear passenger seats with full three point safety belts. 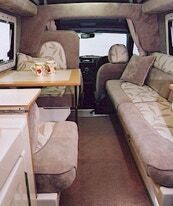 The pullman layout can now be used on both sides of the van not just one side as on other models. The kitchen or galley consists of a two burner hob (no grill) with a fridge beneath on one side and on the other a sink with cupboards above and below. There are pelmets above the two side windows giving extra storage space for all those bits and bobs and a clever pull out storage for the table under the luton area which also gives lots of space (in the hi model) for lots of other camping necessities. Further storage can be found under the comfortable side seats, which convert into to single or a large double bed for a comfortable nights sleep. A large heiki roof light in the living area gives plenty of natural light and ventilation when needed. At the moment the porta potti fits into a neat little drawer in the L-shaped lounge layout but Romahome plan to offer a toilet option as in previous models where the porta potti sits under the sink which lifts up to enable you to use the porta potti. This however means you don&apos;t have a cupboard under the sink.